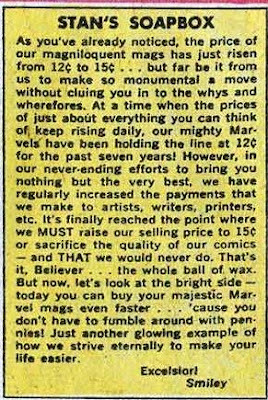 As I have discussed in the past, one of the more durable features to start in the Silver Age was the Bullpen Bulletins page, where Stan would let us know who just had a baby, who just bought a new sports car, and along the way would put in plugs for all of Marvel's magazines. Obviously Stan was pro-civil rights and with regard to increased crime, we can assume he was against it. But Vietnam? I have read almost all the Marvel Silver Age, and while Stan was stridently anti-communist in the early 1960s (especially in the Iron Man series), by the mid-1960s the commie villains had mostly disappeared. We didn't really know where stood Stan on the war in Southeast Asia. Hoo-boy would that change! The following month, Stan wrote about how he lived and breathed with his characters; their problems were his problems. Then came a post about the Marvel-DC (referred to as Brand Ecch) rivalry, where Stan said that he didn't see himself as catering to the same audience. Marvel's readers were bright, imaginative, informal and sophisticated (and they were all above-average). DC's product was pablum for the kiddies before they graduated to his titles. The next month there was a plug for the new Captain Marvel series he was launching, followed by an explanation of the Comics Code Authority. 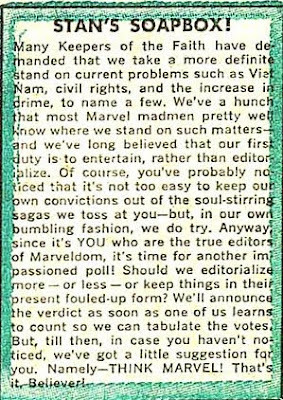 Then came a notice about the updated mastheads of Strange Tales, Tales to Astonish, etc. 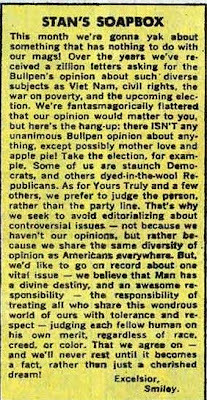 In April of 1968, Stan announced that he was dropping the "Brand Echh" references to DC. 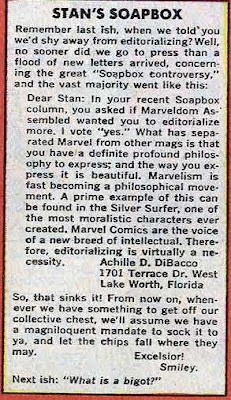 The following month Stan issued a teaser for the next month's soapbox, in which he announced the forthcoming publication of the Spectacular Spiderman, an over-sized comic book on higher quality paper selling for 35 cents. Unfortunately, the experiment apparently didn't sell, as only two issues were printed. Then followed a defense of comic books as entertainment. Stan really wasn't tackling the tough subjects yet. The next month Stan took back a recently instituted policy of not replying to the letters published in Marvel Comics. He had previously requested shorter letters (no more than one page), explaining that he actually read each missive. Then came a short bit about how he came up with story ideas, followed by a plea for people to stop using labels and a bit of moral relativism about how even the Marvel bad guys had good qualities. The next month, Stan apologized for not giving the Inhumans their own book yet. Then came a bit about how the words of the apostles of love (Buddha, Jesus Christ and... Moses?) resonated centuries later, while the proponents of hate had their words die with them. 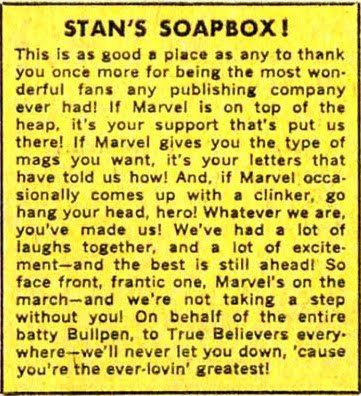 Then came an explanation for why Stan didn't alert his readers to upcoming appearances on TV and radio by himself and other members of the bullpen. It was simply that they didn't have enough advance notice. The following month, Stan explained that in the event a Thor crossover with Nick Fury, Agent of Shield came in the latter's mag, that we shouldn't be concerned that in Thor's own mag he'd been off in Asgard or somewhere else. The stories weren't taking place at the exact same time. In October of 1969, Stan announced the ending of continued stories; each issue was going to be self-contained. Of course, that didn't last long at all. Great post. 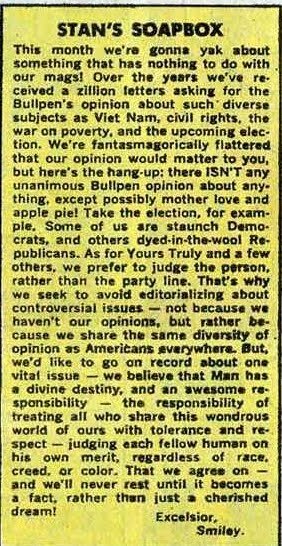 I always enjoy looking through old Marvel and reading the Soapbox, Bulletins page, letters pages, and house ads. They gave the books such a distinct style and character. Yes, thanks very much for posting these! Karen's right, the letters pages, the Soapbox, the ads for the MMMS, et al, added a lot to the unique pleasure that was Marvel Comics! I actually remember reading each of those in the '60s-- but who knew what the future held for young Mark Evanier! I especially enjoyed that, and highly recommend his biography, "Kirby, King of Comics!"